Years ago when I still lived in Ontario I met someone who would eventually turn into one of my closest friends. We worked in the same record store, listened to the same music and wore the same thrift store clothes. One day she invited me over for dinner and we ate make-shift fajitas filled with stir fried onions and peppers and piled with ungodly amounts of sour cream, hot sauce and cheese. It was such a simple meal but I thought it was fantastic. A year later, we moved to Vancouver together, were roommates for a few years (where we worked in opposing record stores) and still remain great friends. And while we’ve gone through more boyfriends and apartments and jobs than I’d care to admit, I’ve always carried this stand-by meal close to my heart. This dish is a cinch to prepare and it’s spicy and creamy and cooling all at once. I love how the hot sauce mingles with the cold sour cream and the vegetables leech out their delicious juices into the perfect bite. 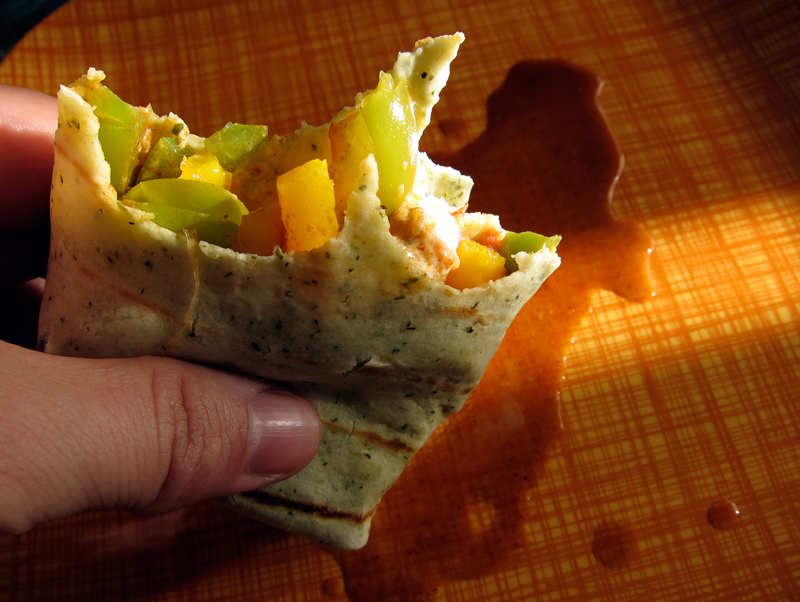 The base is just peppers and onions and this is my favorite way to eat this fajita wrap. But I’ve also thrown in green beans, broccoli, zucchini and whatever vegetable happens to be lingering in the fridge. I’ve added chicken & sprouts and wrote about it once too. I made this meal a few weeks ago and my friend had called up that very night. I told her how I had made the fajitas and how much they brought me back to those good old days of our twenties and how we had struggled with bills and crazy romances and late night rock shows. I’m through with crazy boyfriends and drama, but I’m happy to have this simple and quick meal in my back pocket. 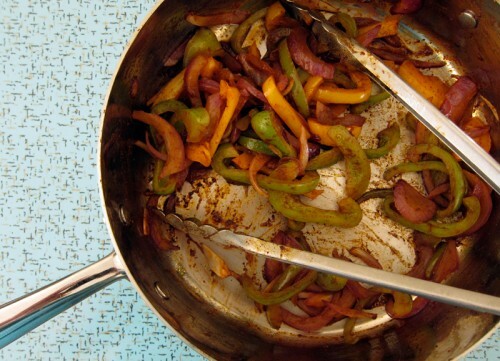 oh yum…aren’t fajitas the best?! summer in a meal really…will have to try this..without the husband, who’s aversion to vegetables makes me wonder if he’s normal. ha. my kind of snack made into a meal. love this girl! How perfect. This reminds me of my vegetarian years when my idea of cheese steak sub was sauteed mushrooms and onions thrown into a sub roll with some cheese and then toasted until it found it’s crispy zenith. Delicious. This story really made me smile. Old friends—the ones who have seen you through it all—are so important. Standby weeknight meals are comforts in their own right, too. I’m happy you have both in your life! I make this exact same thing all of the time! I call it my fridge cleaner because we always make it when we are completely low on groceries and have some random leftover veggies lying around. I’ll grill up whatever is in there and make them into yummy fajitas, so even though it’s getting rid of things that will go bad otherwise it’s still really tasty. Of course, I can count on you vanillasugar to love this! Wow, Tracy, that sounds amazing. Amie, yes, it’s a total fridge cleaner! What a great story. Now I miss my old friends, and I’m craving a fajita. Thanks for the reminder – of how simple but delicious fajitas are and to make some phone calls and catch up. It’s always nice to have meals that bring on the memories without the hardships. I love how simple yet tasty these are! This is a great one to keep on file…we’re huge fajita fans around here! I love the story too. That’s one of the things I love about cooking: collecting recipes from various friends, family, co-workers. They all bring back wonderful memories. What a great meal! Delicious. Fajitas are a fave for me and my friends/family, too. Will have to try this. looks and sounds wonderful! i have a recipe that is very similar that i have made for years, but the veggies are all roasted, and it takes over an hour…it never occured to me to saute them! Yum this is the kind of meal I could eat every night! awwwww what a lovely post. friends + food = unforgettable memories. keep having lots!! I had something similar to this at a restaurant once. These look heaps nicer though! I just had fajita’s at a rehearsal dinner and thought, wow, I really need to make these. I hadn’t yet sat down to figure out the spices, when I read your post. Thanks for sharing: these will likely be tonight’s dinner. Grilled peppers and onions with lots of salsa and cheese make me soo happy! Who needs chicken or beef, right?? Such pretty colors too! How delicious!! Love that this is a simple, satisfying, delicious veggie meal. Thanks for sharing! Thanks Julie, glad I could serve as a reminder. Joanne, these are super simple. I’m craving one right now, in fact. Food is great for that, newlywed! Cindy, I’ve always sauteed them cuz it’s so simple that way & it almost takes like a fajita from a restaurant! Yes, Ursula: t = teaspoon & T = tablespoon. I should make that more clear in my FAQ. Bridgit, hope you enjoy them! Sues, I like these just with peppers & onions best. Please do not feel obligated to play along, I simply wanted more people to read your blog! It is wonderful. So funny. When I was in college, I made pepper & onion fajitas for my roommates all the time. Such an easy meal, and it didn’t break the bank. I still make fajitas some nights when I don’t feel like spending a lot of time in the kitchen. 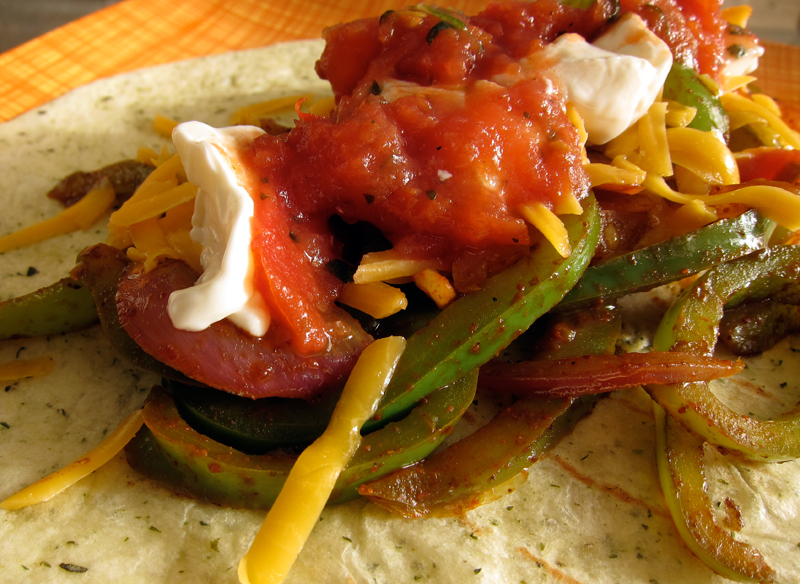 And these days, we often throw heaps of veg on the grill outside and pile them into tortillas. With that oh-so-necessary squeeze of fresh lime juice. So good. I love the sound of this fajita recipe! 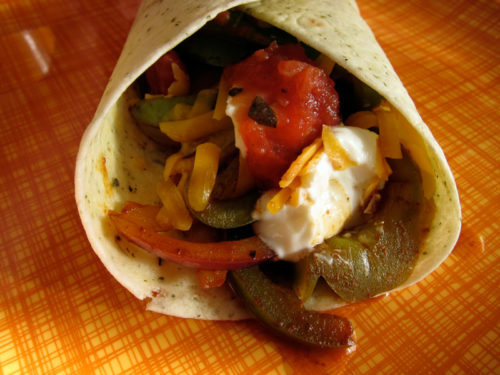 Sauteed peppers and onions are one of my favourite combos, add to that sour cream and salsa and I’m sold! Just found this recipe as I’m moving towards vegan. These are frickin’ fantastic. Thank you!!!!!! !